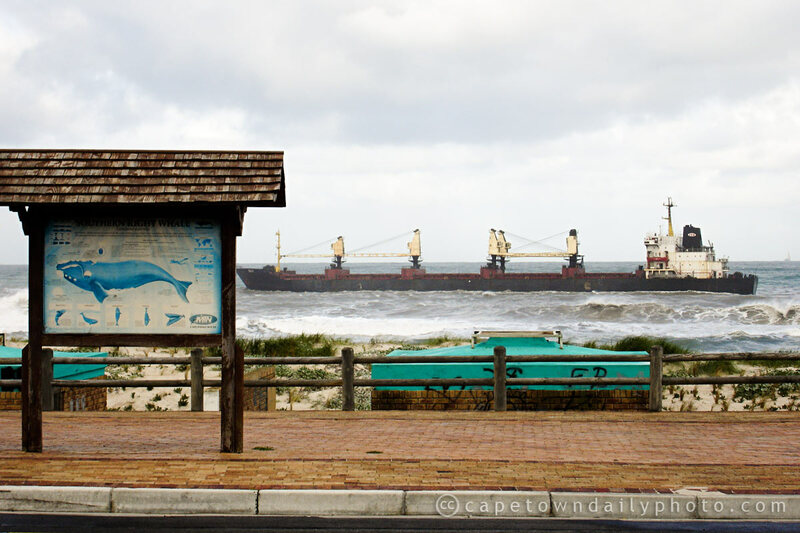 With all the bad weather we've been having this week, a Turkish bulk carrier laden with oil and iron ran aground at Blouberg Beach in Table Bay on Monday night. I've been at work all day, but fortunately one of our readers, Pedro, from Belbon Hills wine farm managed to snap this photo for us en route to the farm. The 25 crew members were air-lifted to safety, but concerns have now been raised about a small leak that could turn nasty. The South African Department of Environmental Affairs are looking into the matter, but I'm not sure how much can be done right now - except perhaps for pumping the oil from the vessel! Click here to read the original Reuters report. EDIT: Please see my comment below. Posted in News and tagged sea, ship on Tuesday, 8 September, 2009 by Paul. Ship wrecks are great to photograph, cause doesn’t matter how old or new they are, it always seem different from the last. The problem is just that they aren’t environmentally friendly. Please sea ;) my next post about the ship. I found the NSRI article on the rescue and from it I learned that she doesn’t seem to be carrying oil, nor were the crew air lifted! Apologies for the incorrect information. Aaaah I knew about this as Fiona lives out there and it’s ‘her beach’ so she posted a photo for us on the forum..